MEPs in Strasbourg have voted on a non-legislative resolution which calls for the EU to “respond to information warfare by Russia.” RT and Sputnik news agency are alleged to be among the most dangerous "tools" of "hostile propaganda." The EU Parliament's resolution demonstrates "political degradation" in regard to the "idea of democracy" in the West, Russian President Vladimir Putin said on Wednesday, commenting on the vote. Putin pointed out that while "everyone tries to lecture" Russia on democracy, European lawmakers themselves resort to a policy of restrictions, "which is not the best way" to deal with any issues. "The best approach is an open discussion, in which bright and solid arguments to support one's point of view should be presented," Putin said. Adding that he hopes the Western move to "counter Russian propaganda" won't lead to serious restrictions, the president congratulated RT and Sputnik journalists on their work. 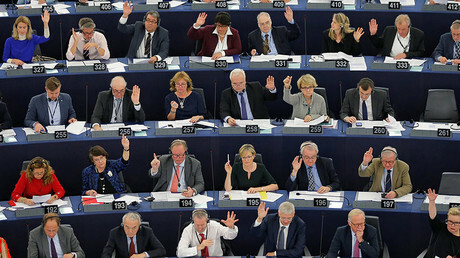 In the Wednesday vote, 304 MEPs supported the resolution based on the report ‘EU strategic communication to counteract propaganda against it by third parties’, with 179 voting against it and 208 abstaining. Written by a Polish member of the European Conservatives and Reformists (ECR) group, Anna Fotyga, the report alleged that Moscow aims to "distort the truth, provoke doubt, divide the EU and its North American partners, paralyze the decision-making process, discredit the EU institutions and incite fear and uncertainty among EU citizens." At the same time, Russia is accused of "information warfare," with such entities as RT TV channel, Sputnik news agency, Rossotrudnichestvo federal agency and the Russkiy Mir (Russian World) fund alleged to be among its most threatening propaganda "tools." The document places Russian media organizations alongside terrorist groups such as Islamic State (IS, formerly ISIS/ISIL). The report also mentions some "social media and internet trolls" from Russia who are thought to "challenge democratic values." It called for the establishment of measures to tackle the perceived Russian propaganda threat, by means of "investing in awareness raising, education, online and local media." It also suggests stronger cooperation between the EU and NATO "on strategic communication." Sputnik has already appealed to the UN, the Organization for Security and Co-operation in Europe (OSCE) and a number of international journalists' organizations and NGOs, including Reporters Without Borders, to take measures to stop what it considers to be interference into freedom of speech in the EU. "The resolution hits straight at a number of respected media, including Sputnik agency, and has an aim to stop their activity in the EU. Moreover, the resolution bluntly contradicts the EU's own human rights and freedom of press norms," reads the letter signed by Sputnik Editor-in-Chief Margarita Simonyan. 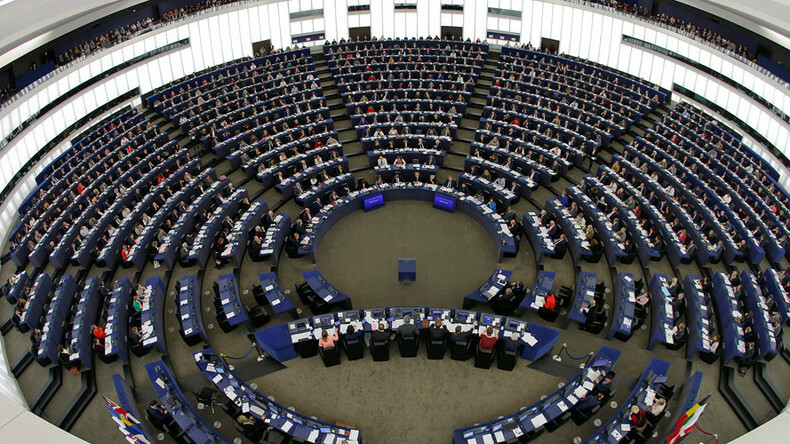 During the parliamentary debate that preceded the vote, MEPs campaigning for the resolution said the EU was "at war with Russia, on a collision course with each other traveling faster than a jet fighter," and that with an alleged "aim to split Europe, the Kremlin forces its information into our countries." "The report is unjustified, it's not objective and is one-sided," Greek Independent MEP, Notis Marias told RT, adding that the total number of lawmakers who voted against the resolution or abstained from voting shows that "the majority of the MEPs in this house do not actually accept" it. Many of those who supported the document are from eastern Europe, Marias said, while those representing the southern part of the bloc either abstained or voted against it. "I find that the resolution is going the wrong way, because we need to have better relations with Russia, which is better for the European economy, for security and this is the new trend in the United States that we have to take into account," he added. Before the Wednesday vote, the document had been criticized by some MEPs, who called it both "insane" and "ridiculous." The EU "desperately needs an enemy, be it Russia or any other," that it can blame for any of its own failures, French MEP Jean-Luc Schaffhaueser told RT. Spanish MEP Javier Couso Permuy said "it fosters hysteria against Russia," while British MEP James Carver noted the report is "worryingly reminiscent of the Cold War." The Russian authorities have always treated foreign media working in Russia with respect, and have “never discriminated” against journalists from other countries, Russia’s Foreign Ministry spokeswoman Maria Zakharova said in an interview with Rossiya 1 TV channel. 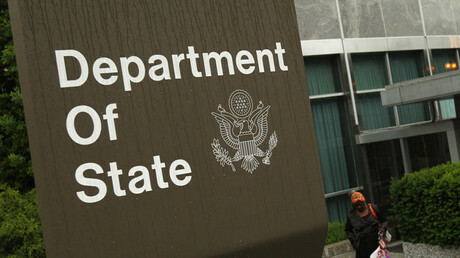 Moscow has never prevented anyone from making reports from Russia based on their contents and ideology, the diplomat said, adding that it now might be forced to act accordingly and respond to the EU’s moves if Russian journalists are oppressed in the West. “It’s not our choice, and we don’t want to fuel tensions,” she said. Moscow earlier said it would be forced to take reciprocal steps to the EU lawmakers' "unfriendly actions." Having called the MEPs' move "cynical," the Russian Federation Council member on international affairs, Igor Morozov, said that European lawmakers "should be aware that their unfriendly actions" would cause a "very tough response" from Moscow.